My healthy haircare routine is pretty simple: I wash my hair 2-3 times per week, usually let it air dry overnight, and touch up my natural waves in the morning. 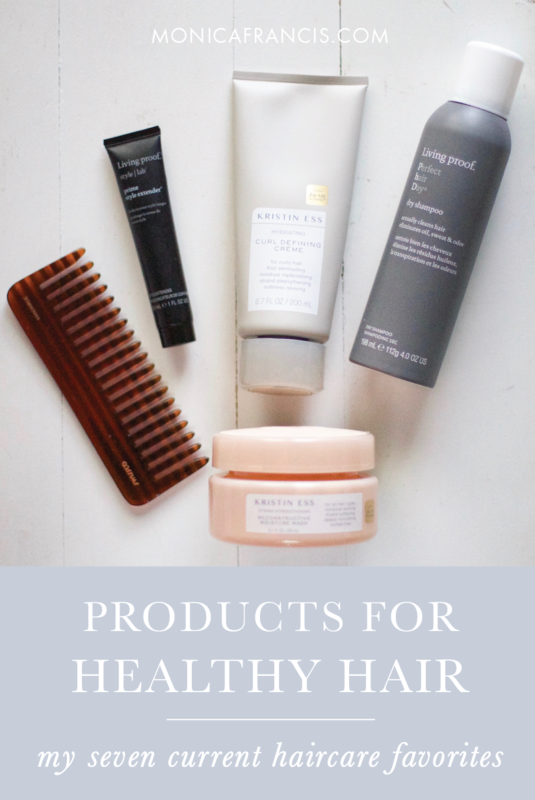 These are the seven products that I always have on hand to get 3-4 days between washes, fight frizz, and avoid heat styling as much as possible. 1. Hair Mask: Because my hair is pretty dry and prone to frizz, I use a hair mask about once a week. My current favorite is this mask by Kristin Ess. LUSH has a jasmine hair mask that's perfect for avoiding fluffy hair in a humid climate. Occasionally, I'll mix up an egg yolk hair mask and pretend I'm Marie Antoinette. 2. Turban Towel: Using a hair towel like this one is just so much better than using a bath towel, and so much easier than the t-shirt or paper towel methods out there. It helps my hair dry faster and with less frizz - I even bring one along when I travel. 3. Style Extender: One of my newest (and favorite) additions is this style extender serum. It keeps my hair looking better longer and adds a subtle touch of texture and hold. A little goes a long way; I'm still using a sample that I got months ago. 4. Thermal Spray: I've been using this Tresemmé thermal spray for almost ten years and there's no end in sight. Even if I'm not using heat, I comb this through wet hair before it air-dries for a little extra nourishment. It's also great at reviving my natural texture on days 2 and 3, sans frizz. 5. Wide-Tooth Comb: On wet and dry hair, I use this wide-tooth comb to evenly distribute products, minimize breakage, and keep as much of my natural wave as possible. It looks pretty on my vanity, and you can find a fancier version here. I rarely use a brush on my hair, but if I do it's this one. 6. Curl Cream: Even though my hair isn't curly, a dab of this curl cream from Target gives some good texture and moisture when thermal spray alone is not enough. 7. Dry Shampoo: Everyone's favorite hair product is one of mine, too. I switch between Living Proof's version and a brunette tinted Klorane one. Two key tips: apply before you notice your hair is oily, and apply before bed instead of in the morning. Your hair will look and feel so much better!